This is an excerpt from a larger article about Harold Camping written in 2002 by James R. White of the Christian Research Institute (http://www.equip.org/articles/harold-camping). Every Christian ought to read it, whether you know or care about Harold Camping or not. 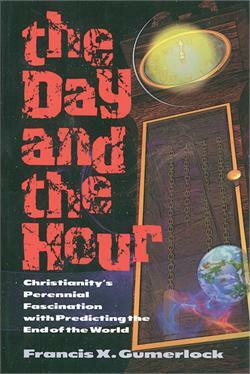 There has been a lot of criticism--and rightfully so--of Harold Camping's attempt to predict "the day and the hour." But what underlies that prediction is an entire approach to Biblical interpretation which is not unique to Mr. Camping. The same method of allegorical Bible interpretation is fairly widespread, particularly in Charismatic and Pentecostal churches. I have seen it used to make the Bible say things which the text was never intended to say. I have seen this approach used to invent or justify all kinds of spurious theological ideas and I have seen the detrimental real-world consequences. The single most important lesson I ever learned about studying the Bible was to ask this question: "What did it mean to the original hearers?" That should always be our starting point in Bible study. When we untether scriptures from their original context, we open ourselves up to the type of error which has now caused Camping and his followers embarrassment and ruin. How has Camping arrived at the conclusion that the church has been destroyed? There is one simple answer: unfettered, inconsistent, arbitrary, and, at times, incoherent allegorical interpretation of the text of Scripture. Camping has long taught the view, popularized by Origen in the early church, that first sees a basic, literal meaning anyone can understand. More important is the moral meaning, which requires more insight. Most important is the “real” meaning, or the “spiritual” meaning, which requires spiritual insight and knowledge. According to Camping, every passage of the Bible has some relevance to the gospel message. Allegorical interpretation ignores the grammar and original context of the Scriptures, which is why it must be rejected as a valid method of interpretation. It is simply unverifiable. In other words, no person using the allegorical method can honestly and logically affirm that his or her conclusions are actually based upon the text that is being interpreted. Because the actual meaning of the text is ignored, the allegorical meaning can have no more weight than one invests in the allegorical interpreter. Since each allegorical interpreter may “see” or “feel” something different in the text, allegorical interpretations can never be verified by others working with the same text (unlike real biblical exegesis, where the work of generations of scholars verifies and reverifies the conclusions already reached). The result of this fatal flaw in the system is that no allegorical interpretation can claim the authority of the original text. This is because the source of the interpretation is not the text itself but the mind of the interpreter who “sees” things in it. Allegorical interpretation cannot compel anyone else to belief since it is personally derived, and the people who accept it do so only because they accept the word of the interpreter, not because they invest any authority in the text itself. Allegorical interpretations have no more authority than the one announcing them. Allegorical interpretation destroys the authority of the text of Scripture. No one using this method can honestly say, “The Word of God says,” for their system replaces the meaning of the text (which is communicated through grammar, lexical meanings, context, and background) with the more-or-less relevant insights and imagination of the interpreter. Christians believe the Scriptures are “God breathed” (2 Tim. 3:16–17), and therefore are authoritative by nature. When the allegorical interpreter ignores the text, the source of Scripture’s authority is replaced by the thoughts of mere men and women. This leads to every kind of abuse of God’s Word. False teachers often utilize such unverifiable forms of “interpretation” as a cover in order to replace biblical truth with their own false doctrines. Untaught and unstable believers (2 Pet. 3:16) are often susceptible to the “smooth speech” of such teachers, and without solid knowledge of how to properly interpret the Bible, they accept false conclusions, which are presented with great confidence and power. So when we point out Camping’s erroneous use of allegorical interpretation, we are not merely arguing about obtuse, insignificant points of theology. We are defending the very authority of the Scripture, for a Bible that cannot communicate God’s truth consistently to each generation cannot be a solid foundation for the faith. As Carla and I were out goofing around today, we stumbled upon the University District Street Fair--an annual event in Seattle. Several street blocks near the University of Washington are closed off from traffic and lined with hundreds of booths selling jewelry and hand-made soap and tie-dyed apparel and cute hats for children and objects d'art and junk food (lots of junk food). Street musicians compete with acrobats and magicians for tips from passersby. 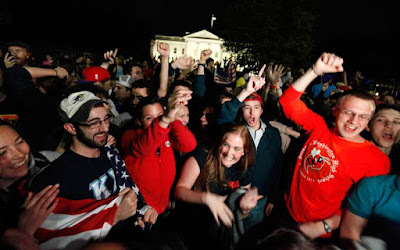 Normally, I hate crowds, but as we strolled along in the flow of the dense throng--surrounded by college kids and street people and hippies and pagans and "respectable" folks--I felt a deep sense of joy. God loves these people. All of them. They are treasures--the work of His hand. My favorite spot was a street block set aside for religious and activist groups. There were annoyed-looking Vegans and animal rights activists with photos of factory chicken farms; there were Scientologists giving free e-meter readings and Atheists loudly mocking the non-rapture of May 21st (I good-naturedly chided them that they were going for the low-hanging fruit on that one and they good-naturedly agreed). A tarot card reader was gazing into the face of his customer with an expression of deep caring and concern. I happened to meet eyes with a young man at the Muslim booth and we both spontaneously smiled broadly at each other and nodded--an unspoken pledge of acceptance. One sight caused me to giggle uncontrollably: Sandwiched in-between booths promoting the Humanist Club of Washington and a Buddhist temple (replete with real live monks) was a pair of suit-and-tie Jehovah's Witnesses, looking completely miserable. I could almost read their minds by the expressions on their faces: "What the hell are we doing here?" (Jehovah's Witnesses tend to be terrified of demons and of coming into contact with anything that might be demonically charged which, in their view, is pretty much any other religion). The street fair was a microcosm of humankind: Beautiful and ridiculous and creative and confused and slightly dangerous and constantly searching and utterly, utterly, utterly beloved. 'Budrus' is now out on DVD and is available from Netflix. It is a powerful and moving film about peacemaking and nonviolent resistance to injustice. Carla and I were once invited, by the pastor of the church we belonged to at the time, to attend a big denominational conference on "Emerging Leaders." Since we were emerging as leaders within our church, it seemed like good timing. Also, the three of us had an inkling that Carla and I might be called to eventually plant a church (this particular denomination places a high priority on church planting). We were quite excited to go. Once at the conference, however, our excitement turned to disappointment as we realized that "emerging leaders" was a euphemism for "young leaders"--as in, twenty-somethings. Since we were over 40, Carla and I were clearly outside the intended demographic and thus, undesirable. We were has-beens; past our prime. We felt excluded. During one of the Q&A sessions, I brought this up to the man heading the conference, who was also in charge of leadership development for the denomination. I specifically asked for his views on the place and value of elders in leadership. He replied that he was only interested in "investing" in young adults. These were the leaders he was looking for. Carla and I left feeling marginalized and dejected. Our pastor was apologetic. It is exciting to see young people being encouraged and mentored for leadership. Young people bring passion, vigor and relevance to the dominant media culture. But, in my observation, they also tend to bring impatience, inexperience and not- yet-fully-formed personal character. I have seen much damage caused by immature leaders who were sent out to plant and pastor churches. 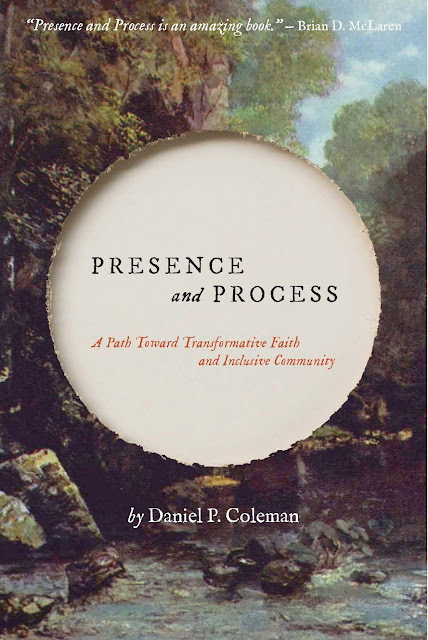 A few years later, Carla and I became Quakers and joined a Quaker meeting which had more elderly people in it than I had ever interacted with in a church. Contrary to the stereotype of cranky old people "stuck in their ways", we found these elderly Friends to be warm, open and pliable to the Spirit. The crucible of time has developed in them tremendous reserves of wisdom, patience and character. But they do tire more easily and tend not to be up on Twitter and Facebook. It seems to me that what works best in leadership is a partnership of old and young. The older ones provide steadiness, the younger ones provide energy. The younger ones push their elders a bit, the elders pull the young leaders back a bit. Timothy needs a Paul and Paul needs a Timothy. Additionally, who are we to limit whom God can use? I'm certain that the leader of that conference, if consulted by God, would never have suggested Abraham and Sarah as candidates to conceive the child of the promise. But God often doesn't do things according to our assumptions and methodologies. Instead of filtering people according to our parameters, shouldn't we instead simply look for whom God is using and bless them? This is why I like the Quaker term of "recording" ministers, as opposed to "ordaining" them. It puts the emphasis on observing and noting what God is doing, rather than asking God's blessing upon what we are doing. The "Emerging Leaders" conference was a valuable learning experience for me. As a heterosexual middle-class American white male, marginalization is something I have not had a lot of personal experience with--certainly not compared to my gay or female or poor or non-white friends. I've tried to hold on to the memory of what it felt like to be told that I was ontologically unsuitable, so that I can endeavor to never make anyone else feel that way. "If Saudi Arabia were a democracy, Osama bin Laden would have become a politician instead of a terrorist." - Imam Feisal Abdul Rauf on the need for democracy in the Arab nations. Last night Carla, some friend and I went to hear Feisal Abdul Rauf (Imam of the "ground zero mosque") speak at St. Mark's Episcopal church in Seattle as part of a conference entitled Confronting Islamophobia. It was very good. Rauf comes across as a humble, intelligent, eloquent and godly man (I found out later that he has a masters degree in Physics). One of his goals is to promote a moderate, spiritual form of Islam (he is a Sufi) which emphasizes a deep relationship with God "from the inside out instead of from the outside in." He has worked for the U.S. State Department, travelling to Muslim countries to promote moderation and democracy. There were a few protestors across the street, holding up placards and a smattering of police officers posted in the church. How sad. There was lots of Q&A. Some of those asking questions were rather rude, but Rauf was patient and unoffended. When, in answer to a question, he shared his own story about how he had a personal encounter with the presence of God as a young man, it was riveting (and not at all unlike many Christian testimonies--including my own). I spoke with him briefly afterwards and when I mentioned that I am a Quaker he told me he has many Quaker friends and that he spoke recently at the Friends Meeting of Washington D.C.
"Osama's overall strategy against much larger enemies such as the Soviet Union and United States was to lure them into a long War of Attrition in Muslim countries, attracting large numbers of jihadists who would never surrender. He believed this would lead to economic collapse of the enemy nation. Al-Qaeda manuals clearly outline this strategy. The Soviet Union collapsed following years of fighting in Afghanistan, and several prominent authors have stated that the United States was on the verge of suffering the same fate, losing countless trillions of dollars to the ongoing conflict. In this sense, some have credited Osama as the one person who was successful in his fight against both of the world superpowers." And our leaders fell for it. A couple of weeks ago at our Sunday morning Bible study at North Seattle Friends, the topic of prophets came up. We discussed that the primary message of the Old Testament prophets to their people and leaders was about God's desire for "social justice"--caring for the poor, seeking fairness for the marginalized, living lives of integrity, etc. Someone asked, "Are their any prophets like that nowadays?" The one who immediately sprang to mind was Martin Luther King, Jr. He was a prophet, very much cut from the same cloth as the OT prophets. He confronted a nation about it's sins and injustices. Everyone in the study agreed. Then I mentioned Gandhi. 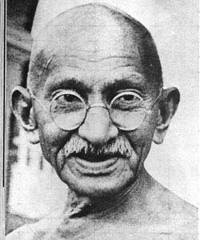 I believe Gandhi was also a prophet, used by God. Gandhi confronted a "Christian" nation about the egregious sins and injustices it was committing against the Indian people. Gandhi's message still challenges us today. No one at the study had a problem with the idea of Gandhi as prophet. This is just one more reason why I love Quakers. "But," I can hear someone out there saying, "Gandhi wasn't even a Christian!" True, in the sense that he didn't profess Jesus Christ as his personal Lord and Savior. Then again, neither did Isaiah, or Amos, or Jeremiah or any other of the Old Testament prophets. And perhaps Gandhi was a follower of Jesus to a much greater degree than many nowadays who do profess to be Christian, including some who have a national stage.